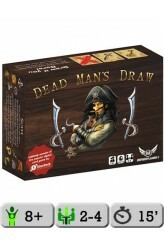 Dead Man's Draw is a simple and strategic card game of risk and reward for 2 to 4 players. Players take turns drawing cards and combining their special abilities to plunder the most loot without busting their entire hands. The core of your turn in Dead Man’s Draw is all in the flip: pulling the top card off the deck and using its special ability. Your turn isn’t over until you say it is, though. You can keep pulling cards as long as you like – until you play a card of a suit already seen, at which point you lose everything. Knowing when to stop and "bank" your cards is the biggest decision you make in Dead Man’s Draw, but being too timid lets braver opponents pass you up with bigger, more profitable turns. The cards’ special abilities are key to success in Dead Man’s Draw, and t.. 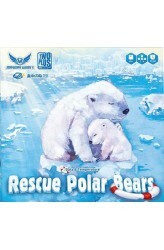 Rescue Polar Bears: Data & Temperature is a cooperative game based on Rescue Polar Bears with a new data and temperature system added to the game design to make the strategy more diversified. The consumption of fossil fuel and releasing of greenhouse gases yield the global warming. Around the north pole, the last icebergs are melting and the polar bears are facing the risk of being extinct. The players form a scientific organization. They try to collect data about climate change to persuade the governments to change their energy policy. At the same time, they also need to prevent polar bears from sinking into the freezing water. Each player drives a rescue ship of different ability to complete the mission on the Arctic Ocean. 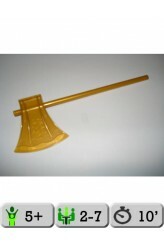 As long as the players coll..
A dexterity game where nine plastic tree segments are stacked up. Each tree segment has four bark sections around it. 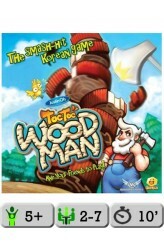 On their turn, a player gets two taps with the axe to try and knock off pieces of bark from the tree segments for one point a piece. But be careful, if a tree segment comes down it's minus 5 points! A quick unique dexterity game. https://www.youtube.com/watch?v=l1_t_5_dX2U .. The Golden Axe Expansion comes as a result of several testers saying they wished the game had two axes, it makes playing the game that much quicker, and it also gives you the opportunity for options on your turn. Some of the variants with the Golden Axe include opting to use the Golden Axe for only ONE hit rather than the normal TWO on your turn, but if you do get anything to fall you get double the points! This can help you catch up if you're behind... or kill you if you aren't careful. 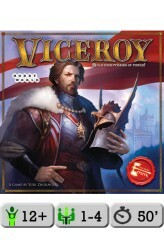 ..
Viceroy is a board game of bidding and resource management set in the fantasy universe of the famous Russian CCG Berserk. As the players struggle for control over the world of Laar, they recruit a variety of allies and enact various laws. These cards allow players to develop their state's military and magical might, increase their authority, and get precious gems they need to continue expanding their nation. As the game progresses, each player builds his own power pyramid using character and law cards. Each card has its own effect that depends on the level of the pyramid where the card is played. These effects may give more resources, more cards, or victory points. The player who has the most power points at the end of the game becomes the ruler of entire Laar and the winner! &n..